Due to the advancement of technology over the last few years and the rise in use of Social media such as facebook and Twitter and Instagram and others, I'm not sure if anyone actually reads this blog anymore and I'm not sure if anyone ever does any blogging. It's been a long time coming but Cando FM launched on Monday rd November 5 and I am back on the radio part time. It's been a long time coming and over the last few years a new radio station for Barrow In Furness is getting ready to launch on FM. It has been broadcasting on the internet for over 4 years and has grown from strength to strength. Check out their website and see what you think. Also look out for CandoFM on facebook. Its been a long time since I posted here and I'm currently presenting shows at Central FM in Spain. It's not that often I get to post on here and have moved most the activity to the "Bill Clark On The Radio Facebook page" where most updates are now taking place. Feel free to have a wonder over to www.facebook.com/billclarkontheradio and join me there. Christmas is a lonely time for a lot of people and if you are going to be alone this Christmas then there are voluntary organisations who's services will be available to you over the festive period. Christmas Days night from 10pm I will be talking about various organisations that can help you as well as chatting live to the Samaritans in Barrow in Furness and putting you in touch with people that can be there for you at Christmas. * SAFE stands for Stop Abuse For Everyone (SAFE) and is available to anyone who has been a victim of domestic violence. They will help you out in a number of ways and they can be contacted directly on Barrow 838746 and are committed to tackling issues of violence and also offer practical support for those in an abusive relationship as well as providing a service for children. * Age Corncern is there for helping the elderly and inirm. They are based at Lakeland House on Abbey Rd in Barrow and they can be contacted on Barrow 831425 or email joanne.smith@acbarrow.org.uk No matter what the issue is then Age Concern are there to help you, It could be anything from dealing with pensions and allowances to help with keeping warm and there are a number of things you can do to keep you and your home warmer this winter. * If you are using an electric blanket make sure you have it checked by a safety expert at least every three years. Age Concern are offering free electric blanket testing in selected areas across the UK. 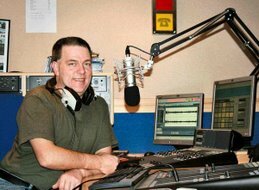 Its been a long time since I last posted in here having not done anything much on the radio apart from the occasional programme here and there on various stations but now I'm back on a radio station based in the Furness area called Radio Furness and am presenting on a regular basis 3 shows a week. Listen out for an acoustic session, a 70's retro session and the famous hits and headlines with the Golden Years has returned as well. Today is the 32nd Anniversary of Elvis Presleys Death and 2 years ago I presented a special hour long feature on the radio dedicated to Elvis, talking about his life and love of music and playing his songs. Feel free to download it and listen. Its a big download so click the link and go put the kettle on. It may take a few minutes. Its been a busy week for me sorting out website reviews as well as putting some stuff together for my production library and making up a few demos as well as doing a bit of taxi driving. This blog seems to be attarcting the attention of lots of people who are interested in my website review of the day and just a reminder that this is also open to other radio stations. If you are a radio presenter and looking for a website review of the day then please feel free to use any that are posted on this blog. As for other radio stuff, I have not been doing much in the way of presenting but have been involved in a bit of background work producing sweepers and idents for a few stations. The other thing I have been doing is trying to keep up with the live music scene so if you are a musicianm and yopu have a gig in Cumbria then please email me and let me know and we can get it promoted here for you. Best of all , its all FREE of charge and lots of people read this blog. I still have some airchecks and snippets from my shows on various radio stations and will eventually get round to uploaidng them onto my youtube site. Below is a short video demo I`ve done. You can hear live radio interviews with them and hear their songs by looking at the audio pages of this blog. More dates from Codejak coming up. CodeJak are playing with New York’s finest: Adam Bomb! NOT TO BE MISSED! The website review of the day feature is still going strong and used on a few radio stations (AM, FM and Internet based) that I have struck deals with so if you want your website reviewing on this blog then get in touch with me with the web address and a description about it. If its reviewed then it will appear in this blog (allow time as there's so many and a backlog from people who have emailed) and once its in this blog then radio stations will lift it from the blog and use it in their programming so you never know whos`s gonna hear about it or read it. HERE IT IS FOLKS, KENDAL CALLING 2009 IS GO, GO, GO! Off the wall performances from a host of artists across the weekend. Also featuring our TRADITIONAL ALE BAR with a specially brewed Kendal Calling beer supplied by DENT BREWERY. Featuring a Solar Powered acoustic area going into the wee hours as well as some great grub. A place to gather when the day is done and trade tales of tom foolery from the days frolics. MORE DETAILS WILL BE ANNOUNCED AS WE MOVE EVER CLOSER TO TAKE OFF!! The website has full details on Line up, Travel, latest news & anything else you'll need to know to navigate your way to a weekend of festival Utopia. 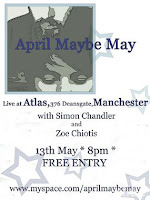 A message from Rosie and Matt of "April Maybe May"
2 gigs this week - Cumbria and London! The mighty AMM show continues this week with appearances at opposite ends of the country. Saturday 27th June we play at Dent Folk Festival in Cumbria. This will be our second appearance at the festival following a memorable show in 2006. We really enjoy the festival, it's a great setting and atmosphere, and this year Ade Edmonson and the Bad Shepherds are headlining! Following our camping trip in Dent we will be heading south to London for our second capital gig. This time we're in Soho, at The Mighty Craic on Greek Street. The show starts at 7.30 and we're on at 8.15. The other acts are Tam Walker and Melpomeni, who is one of the Medieval Babes. It's £5 in, but if you email us we'll put you on the guest list which means you'll get a quid off! the London gig at The Mighty Craic, Soho, is on Tuesday 30th June at 7.30pm. Thank you to Andrew Allan and Barry Bonus for pointing that out in their alliterative way. Who's next, Craig Cooper? Donald Duck? Right, how do you put a tent up? Local Band "Atlas" have appeared on the show in the past and now its your chance to see them live. "Atlas At Day And Night" is on Friday, June 19 at 8:30pm. April Maybe May (Formerly The Fallen Leaves) Album Launch" is on Friday, June 5 at 8:30pm at The Nines in Barrow In Furness. Get yourself along and have a great night. Short notice but if you are looking for a good night out in Dalton tonight (Super Sunday) then join David Duffin @ The Wellington [Dalton] tonite, 'Super' Sunday 24th May - supporting The Mooncats ~ 9pm-late ~ Free Entry !" This Friday sees the recently signed "Codejak" playing lives at Healeys Bar on Hindpool Road. Codejak appeared as a guest of the show and have played live on the radio and its now your chance to see them performing live. "April Maybe May" (Formerly The Fallen leaves) who have appeared on the show in the past are appreaing live this Monday (4th May 2009) in The Garden, Ford Park, Ulverston. The show runs from 1 til 6 in the afternoon, and also features Atlas, The Prophets, The Razzcats and Your Intentions. (Again these bands have been featured on the show and they have been in the studio to perform live) and now its your chance to see them live. £5 entry, bar on site, take no booze! AMM will be playing as a 4-piece with Jake and Pete joining Rosie and Matt for the summer, and will be onstage at 3pm this Monday. Local band ATLAS have appeared on the show, Search this blog for ATLAS for more info. Kendal college 1st and 2nd year degree students perform for a grade. thats how music is judged in 2009. How do you fancy an "Open Mic" nite hosted Chris Garrat & Ash Flower and Dave Duffin who has appeared on the show as a guest playing acoustic guitar in the not so distant past. Great name for a local band who have come a long way and I have had them featured on the show in the past. You can see some of their performances live in the studio by going to www.youtube.com/billclarkontheradio and looking for "Fallen leaves" which was their old name before they changed to April Maybe May. Throughout the months of May and June this fantastic duo are performing live at various places and it is my recommendation for you to go and see them play and sing. Check out their page at www.myspace.com/aprilmaybemay for more info. Gig In The Garden, Ford Park, Ulverston Cost: £5 All dayer featuring loads of cool bands. Atlas, April Maybe May, The Prophets, The Razzcats and Your Intentions. We’re on about 3 ish. Cost: Free Us, Simon Chandler, Zoe Chiotis. Show moved from April cos of football! John and Dave are back with another great nights entertainment of 60's and 70's covers. Luv to see you there! Its a night not to be missed by this fantastic duo who play very well together and guarantees you an excellent night with songs that everyone will remember. More info on John can be found at www.johnl.co.uk and www.barrowmagic.co.uk as John is a very multi-talented guy who can turn his hands and vocal chords to anything. Available for provate parties, he can perform play and sing as well as do magic. Local band, The mooncats launch their brand new album this weekend and you are welcome along. Saturday, April 25 at 8:00pm. Looking for a great nighe out this easter weekend. Super Soul Sunday @ The Last Orders with Hart & Soul. A special chart event on Saturday and a Retro 70s and 80s event on Easter Sunday (with free entry all night for those in fancy dress). Sunday is the Canteen’s traditional big Easter show with Liverpool’s Major Major headlining a who’s who of local talent. Among the bands on the bill include The Relics, The Mooncats, Ramirez, Don’t Tell Grant (acoustic) and Dropping Point. Tickets as ever are on the doors which open at 7.30pm. Also on Easter Sunday in the Cinema Room is the much awaited Luke Solomon and A Darker Disco DJ event in the Cinema Room from 9pm. Easter Sunday, Homegrown present the first Super Sunday of the year. Featured are no less than eight acts, among them Homegrown DJs, Media Monkeys, Musical Mayhem, The Mooncats DJ set, Ste Tyson from The Prophets DJing, Mister Sushi, and full live band Zenfo. On top of that are a few mystery guests plus live graffiti in the garden – weather permitting. All of this plus nice atmosphere, friendly people and a jaegermeister machine, beserk medicine at sub zero temperatures. Playing live are Manchester's Zenfo. This laid back hip-hop quartet have been busy around their hometown scene, playing at the Warehouse project and supporting Nightmares on Wax to name just two recent highlights. Getting the dancefloor moving will be Media Monkeys, on top form with the latest breaks, beats and maybe a little old school magic for good measure, while Mister Sushi will round off with breakbeat, dubstep and twisted disco. With the new sound system now complete, the friendly atmosphere and quality line-up, this should be a Sunday session to remember. Ends 3am and entry is free. Local Band The Mooncats who have appeared on my show in the past have a gig coming up at The Forum 28 in Barrow. Having an excellent following this band are playing exclusively at this gig for the under 18s. Tuesday (April 7) is the date for your diary and is an event that gives young people a chance to see some of the best young bands in town. The Mooncats, who also play Manchester’s Night & Day on April 18. Others in the line-up are Dropping Point, Audio Conspiracy and Galleon. The gig runs from 7pm to 10pm. A great nite out guaranteed so get yourself along. Looking for a good night out with great entertainment., Try The George on Walney this Friday night. Hart and Soul create a sanctuary of warmth and enlightenment, delivering an eclectic set of tunes that were the very essence of hope, revival and no-nonsense good time music. Expect all the legendary Motown, Atlantic, Stax and Chess favourites including classics and modern anthems from Amy Whitehouse and Duffy to name but a few; this was soul heaven right here on earth. If you fancy going to a go-go any time soon, check out this quality outfit and don’t forget to put on your dancing shoes. Jon Byrne is back in his hometown of Barrow In Furness to promote his new Album. "It’s Boring Being in Control " is launched this Saturday at The Nines, where he will be supported by cover band The Smiths Indeed. Jon will do his first show – a solo acoustic supported by Maudlin Rich, Lee Rooney and Paul Byrne, and special guest – from 3pm to 6pm. This will be a free show, open to all ages. (U14s to be accompanied by an adult). Then at 9pm there will be a full band show, a double header with The Smiths Indeed. Tickets are available in advance from Bar 5 and this gig is over 18s only. Following the two Barrow gigs at The Nines, Jon will be playing Cardiff, Oxford, London, Bristol, Birmingham, Sheffield, Liverpool, Newcastle, Chester, Manchester and Glasgow. The Mooncats began when a series of like minded musicians, (sick of hearing bands that could be easily pigeon holed) formed a bond with an urban poet, and began honing their craft. In a very short space of time, The Mooncats were spreading their tales of Barrow life all over the North West of England. The music seemed to come effortlessly, the lyrics almost wrote themselves. The very town that we live in inspired us to write what we write and play how we play. Over the two years or so of The Mooncats full existence (to the form it is today), there have been one or two minor changes made to the line up. Creative differences occur at the best of times, what's said is said, and the future is there for the taking, we don't dwell on what's happened, but take it, build on it, and head to the future. Since the bands creation many moons ago, there have been some vast and incredible musical journeys occur. The people we have met so far along the way have been incredible and we have made some fantastic friends from being involved in the music industry. Neville Staple (The Specials), Miles Hunt (The Wonderstuff), The Airborne Toxic Event, The Holloways, Cajun Dance Party, Sevens, The Dead Class, Gear, Vinnie Peculiar & Many, many more! 2009 is looking to be a very exciting year for The Mooncats as we plan to release both our debut single and album. We hope that many of you take the time to listen to what we do and enjoy it, we are all very happy with how the album sounds and are really excited for the launch. The Album Launch Party was an absolute success! Thank you to everyone who showed their support, we appreciate it! If you still haven't bought our debut album "Everman" you don't know what your missing! You can purchase it online on hard copy or download at: www.codejak.co.uk! CodeJAK won The Best Song of 08 Award in the BAFMP Cumbria Music Awards!